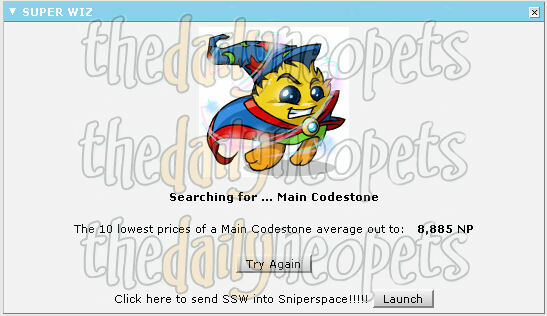 The Super Shop Wizard (SSW) is one of the greatest features that comes with Premium Neopets. It's pretty much just like the regular Shop Wizard, except for three key features that will be explained and shown in full detail. But first, let's just show you what the SSW looks like. 1. 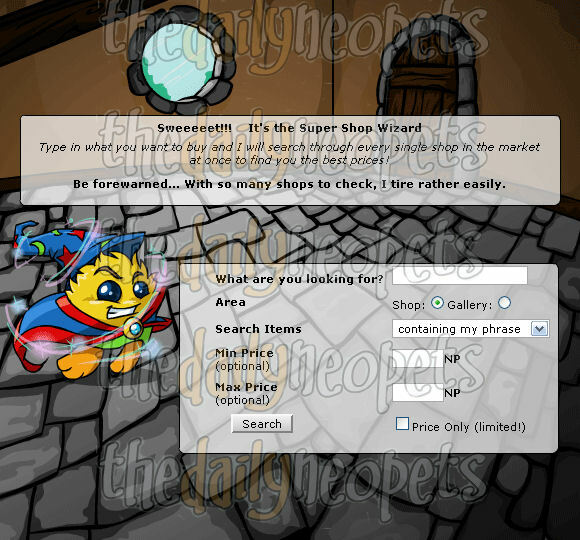 The SSW automatically searches through every single shop in Neopia and finds you the lowest prices around. It puts the lowest shop and price on the top, and works its way down, as shown below. 3. At the bottom of the SSW, there is a little check box, when this is selected the SSW will run a price check for you. All you have to do is type in the item, check the box, and it will automatically take the top 10 prices, average them out, and spit out a price for you. Take a look below. You must be very careful when searching for items with the SSW. Searching to fast will result in a SSW ban which lasts until the hour is up. There are limited to the amount of times you can search and price check. The limits vary for each and every person depending on the rate of your search, so if you search for a Main Codestone, constantly attempting to get it for 1 NP, you could get banned, temporarily, from the SSW. Bans not only happen in sniperspace, but when using the regular SSW in your portal as well. You will receive a message with the amount of time you are banned for, like in the screen shot below. Since Neopets found that this could cause some issues and gives premium members an unfair advantage they have placed the following restrictions onto what items you can not search for: transmogrification potions, petpet paintbrushes, regular paintbrushes, and laboratory map pieces. 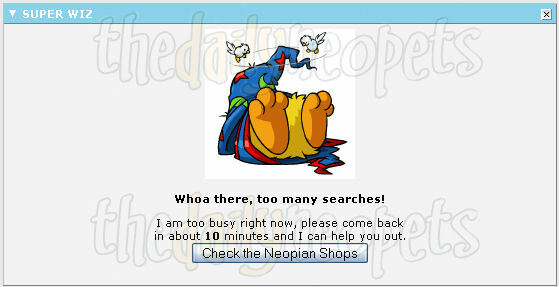 You will receive an error message like the one below, except customized to the item you searched. While the SSW has its benefits (searching for the lowest prices), it also has it's downsides (very fast bans). Remember your ban will last until the hour changes, so if you are an active sniper, keep track of the clock and don't miss a minute. Lucky for you though, you can still use the regular shop wizard. ;) Don't get to spoiled now.